Is there a story for the Hadoop Storage Stack (HDFS+HBase) on Solid State Drive (SSD)? This is a question that I have been asked by quite a few people in the last two days, mostly by people at the OpenComputeSummit. This piece discusses the possible use cases of using SSD with Hadoop or HBase. Currently, there are two primary use cases for HDFS: data warehousing using map-reduce and a key-value store via HBase. In the data warehouse case, data is mostly accessed sequentially from HDFS, thus there isn't much benefit from using a SSD to store data. In a data warehouse, a large portion of queries access only recent data, so one could argue that keeping the last few days of data on SSDs could make queries run faster. But most of our map-reduce jobs are CPU bound (decompression, deserialization, etc) and bottlenecked on map-output-fetch; reducing the data access time from HDFS does not impact the latency of a map-reduce job. Another use case would be to put map outputs on SSDs, this could potentially reduce map-output-fetch times, this is one option that needs some benchmarking. 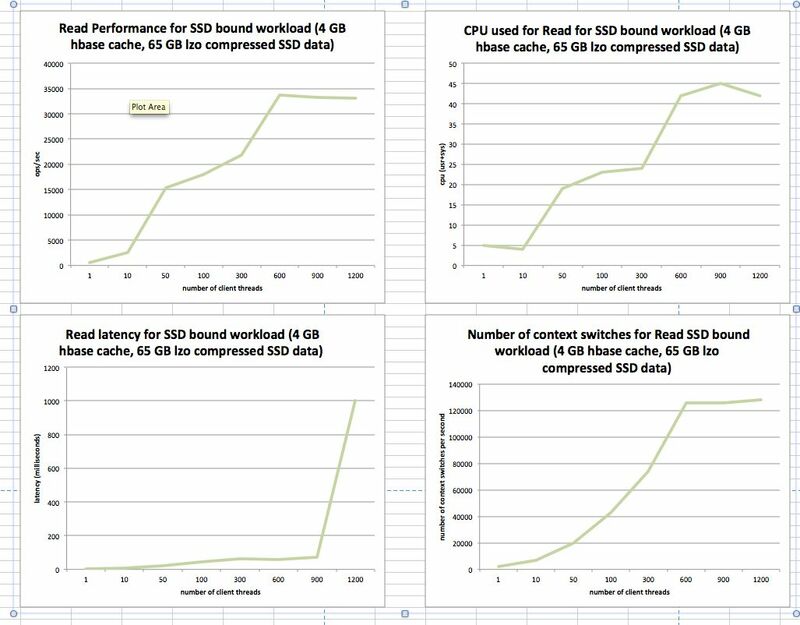 For the secone use-case, HDFS+HBase could theoretically use the full potential of the SSDs to make online-transaction-processing-workloads run faster. This is the use-case that the rest of this blog post tries to address. The read/write latency of data from a SSD is a magnitude smaller than the read/write latency of a spinning disk storage, this is especially true for random reads and writes. For example, a random read from a SSD takes about 30 micro-seconds while a random read from a spinning disk takes 5 to 10 milliseconds. Also, a SSD device can support 100K to 200K operations/sec while a spinning disk controller can possibly issue only 200 to 300 ops/sec. This means that random reads/writes are not a bottleneck on SSDs. On the other hand, most of our existing database technology is designed to store data in spinning disks, so the natural question is "can these databases harness the full potential of the SSDs"? To answer the above question, we ran two separate artificial random-read workloads, one on HDFS and one on HBase. The goal was to stretch these products to the limit and establish their maximum sustainable throughput on SSDs. In the first experiment, we created a HDFS cluster with a single NameNode and a single DataNode. We created a 2 GB HDFS file with a HDFS block size of 256 MB and a replication factor of 1. We configured the DataNode to run on a 16 hyper-threaded cores and it stored block-data on xfs. Our benchmark program was co-located on the DataNode machine and had hdfs-read-shortcircuit swicthed on, i.e. the DFSClient bypassed the DataNode and issued read-calls directly to the local xfs filesystem. The entire 2 GB of data was cached in the OS buffer cache and this benchmark did not trigger any IO from disk. The fact that all the data was in the OS cache essentially simulated the behavior of an ultra-fast SSD. We varied the number of client threads and each client thread did a pre-configured number of 16K read calls from HDFS. Since there were only 8 blocks in the file, the DFSClient cached all the block locations of all these 8 blocks and there were no repeatative calls to the NameNode. The first few iterations of this test showed that HDFS can sustain a max random-read-throughput of around 50K ops/sec, but surprisingly the CPU was not maxed out. We found that the read-shortcircuit code path spent considerable time in DNS lookup calls and updating metric-counters. We fixed these two pieces of code and observed that HDFS could sustain a peak random-read-throughput of around 92K ops/sec, the CPUs was now close to 95% usage. HdfsPreadImage is a plot that captures this scenario. The takeaway is that a database that is layered above HDFS would not be able to utilize all the iops offered by a single SSD. 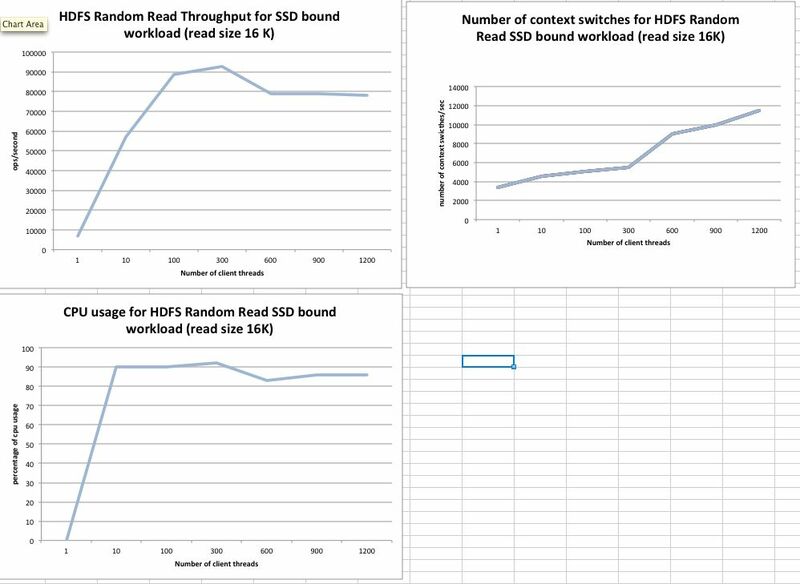 A profiled run of the HDFS code shows that the DFSClient's code path are quite long and causes appreciable impact to throughput for cached random reads. If data-fetch times are in the millisecond range(from spinning disks), the long code paths in the DFSClient do not add appreciable overhead, but when the data is cached in the OS cache (or in SSDs), these code paths need some major rework. Another option would be to write a HDFS readonly-client in C or C++, thereby avoiding some of the overhead of the current Java-based DFSClient. In the second experiment, we did a similar experiment on HBase. We created a single table with a single region and all data was cached in the OS cache of a single HBase regionserver. The OS cache is simulating a super fast SSD device. We used a set of 4 client machines to drive random-get calls to the regionserver. The regionserver was configured to use a maximum of 2000 threads. The HBase table has lzo compression and delta-encoding-fast-diff enabled. Since the data set is cached in OS buffers, this benchmark does not cause any disk io from spinning disks. We saw that the HBase throughput maxes out at around 35K ops/sec and we were not able to drive the CPU usage on that machine to more than 45%. Heavy lock contention and heavy context switching causes the regionserver to not be able to use all the available CPU on the machine. The detailed chart is at Cache4G. The two experiments show that HBase+HDFS, as it stands today, will not be able to harness the full potential that is offered by SSDs. It is possible that some code restructuring could improve the random-read-throughput of these solutions but my guess is that it will need significant engineering time to make HBase+HDFS sustain a throughput of 200K ops/sec. These results are not unique to HBase+HDFS. Experiments on other non-Hadoop databases show that they also need to be re-engineered to achieve SSD-capable throughputs. My conclusion is that database and storage technologies would need to be developed from scratch if we want to utilize the full potential of Solid State Devices. The search is on for there new technologies!